At IIT Delhi, research is being carried out to investigate and develop the effect of various morphological aspects of blends, composites and nanocomposites along with the processing parameters on the film formability of various polymers, such as, LDPE, LLDPE, PP, PLA (biodegradable) along with various polymers (PCL, Nylon, EVA) as a blend and inorganic fillers (nanoclays, talc and other micro fillers) and organic fillers (conducting polymers). The effects of different processing parameters, such as, extruder temperature, die temperature Line speed, die gap, FLD (Freeze line distance), BUR (Blow up ratio) on the final properties of film have been established. 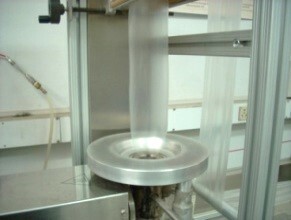 Targeted blown film materials are also characterized and established through various film characterization techniques, related especially to packaging applications. Pilot plant facilities for blown film extrusion process at IIT Delhi. Barrier property of PP nanocomposite films was improved by nanoclay addition. PLA/talc composites blown films showed increased tensile properties and biodegradability. However, developed PLA/PCL blend films showed increased higher thermal stability, higher elongation, toughness, biodegradability and water vapor barrier properties compared to neat PLA film. In lab a PANI based antistatic LLDPE blown film with very less static decay time has been developed. EVA was incorporated in LLDPE/PANI composites to facilitate increase in their electrical conductivity.